As long as I’ve known her, Angela has appreciated anything and everything caramel. Given I’ve found it’s in my best interest to keep her happy, I decided to make her some caramel ice cream. I almost didn’t post this recipe because it didn’t work for me as written. The original recipe had you add the heavy cream to the caramel and that was it. Unfortunately, when I was making this, the caramel solidified in the presence of the heavy cream. Luckily, I realized it would melt again if the heavy cream was heated but I did have to blaze my own trail through the recipe. I have to admit, however, that it may have been might fault. Given Angela’s preferences, I didn’t caramelize the sugar heavily. I think that the sugar simply wasn’t hot enough in comparison to the heavy cream. So, you may not have my issues and the caramel may stay liquid after you add the heavy cream. Despite my difficulties, this was definitely worth it. Homemade ice cream always has a taste premium over store bought but I think that caramel emphasizes that difference. It was very rich but very good. 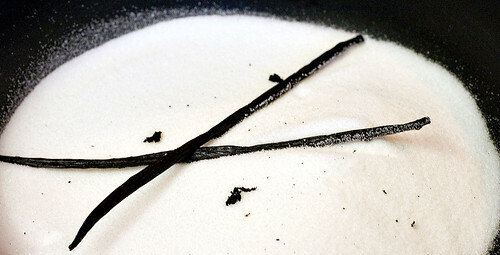 Sprinkle the sugar evenly on the bottom of a heavy sauce pan (perferably non-stick). Add the vanilla bean. Place over medium heat and cook until the sugar caramelizes and begins to smoke, stirring occassionally. Carefully add the heavy cream (it may boil violently). If the caramel is not dissolved in the heavy cream, heat the heavy cream over medium heat stirring regularly, until the caramel has dissolved. Whisk in the half-and-half and the salt. Place the egg yolks in a bowl and whisk together. Slowly whisk in 1/4 of the heavy cream mixture into the egg yolks. Return the egg yolks and heavy cream to the pan. 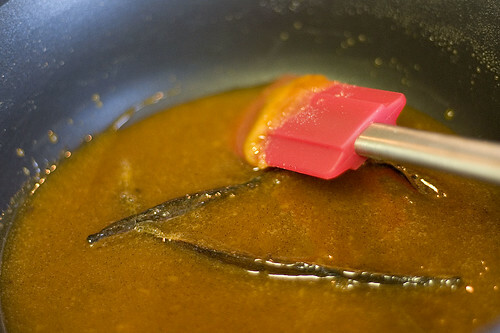 Cook over medium-low heat until the mixture has thickened enough to coat the back of a spoon. Remove from the heat. Pour the mixture through a fine sieve into a bowl. Allow to cool to room temperature, then chill in the refrigerator until cold. Freeze in an ice cream maker according to the manufacturer’s instructions then place in the freezer to complete the freezing process. That ice cream looks good! That ice cream is awesome. Im gonna try it out when I get the ingredients from my weekly groceries. That ice cream was amazing! So rich, creamy, and full of flavor. I just got a copy of The Perfect Scoop, so be prepared for some good homemade ice cream next time you visit.